The Hatteras Island Visitor Center and Museum of the Sea is located in the Cape Hatteras Light keeper's quarters, in Buxton, North Carolina. Exhibits include the history, maritime heritage and natural history of the Outer Banks and the lighthouse. 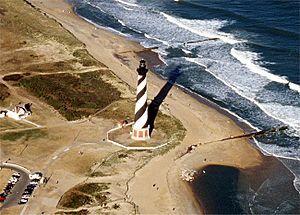 Cape Hatteras National Seashore was authorized by Congress on August 17, 1937. The funds to purchase much of the land for Cape Hatteras National Seashore were donated by multi-millionaire philanthropist Paul Mellon. On June 29, 1940, the name of the park was changed by the U.S. Congress to Cape Hatteras National Seashore Recreational Area. The name change was done to accommodate hunting interests, which at that time was a unique allowance for a National Park Service managed entity. The park was officially established as the first national seashore on January 12, 1953, and dedicated on April 24, 1958, and is currently co-managed with two other Outer Banks parks, Wright Brothers National Memorial in Kill Devil Hills and Fort Raleigh National Historic Site on Roanoke Island. It is headquartered at Fort Raleigh. In October 2007, Defenders of Wildlife, along with the National Audubon Society, sued the National Park Service at Cape Hatteras National Seashore for not properly protecting shorebird and sea turtle species that nest on the beaches of the Park. The Park Service was found not to be in compliance with an executive order requiring the establishment of policies and procedures regarding off-road vehicle use on the National Seashore, failing to implement management plans to adequately protect the shorebirds and sea turtles nesting in the park. The Defenders of Wildlife have claimed that the use of off-road vehicles on park lands has degraded the habitat used by the nesting birds, many of which are also federally protected species. Many of the beaches and beach access points were placed off limits to off road vehicle use during the months when the birds are nesting. This became a contentious issue among some residents and users of Hatteras Island as ORV access is considered by some to be an important part of regional culture and economics, despite a 2008 study that found that only 3-4% of annual visitors to the National Seashore are ORV users. In January 2012, the National Park Service instituted its new, and final, ORV management plan. Twenty-eight of the seashore’s 67 miles are set aside as year-round ORV routes, with only 26 miles designated as year-round vehicle-free areas for pedestrians, families, and wildlife. The remaining 13 miles of seashore are seasonally open to ORVs. For instance, during the first week of July 2012, while less than 20 miles of the beaches are accessible by ORVs, an additional 31.6 miles were open to pedestrians, meaning 78% of the Seashore was open to visitors in some form. The plan also proposes new parking facilities, ORV ramps, and water shuttles to increase visitor access to beaches. Cape Hatteras National Seashore Facts for Kids. Kiddle Encyclopedia.